The fourth entry in the classic weapons-based fighting series comes to PS3. 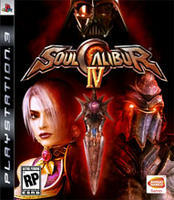 In Soulcalibur IV, the epic struggle between the spirit sword, Soul Calibur, and the cursed sword, Soul Edge, continues with revelations about this ongoing story as fighters from across the galaxy seek the powerful swords for their own goals and to face the ultimate judgment. Propelling the franchise into the next-generation, Soulcalibur IV flexes its graphical muscles to shows its visual brilliance with a new look for both allies and enemies. LAS VEGAS, Nevada, (January 9, 2008) - Swords and Lightsabers will be drawn as NAMCO BANDAI Games America Inc. and LucasArts today announced that iconic Star Wars characters will appear in Soulcalibur® IV for the PLAYSTATION 3 computer entertainment system and Xbox 360 video game and entertainment system from Microsoft. As part of this monumental collaboration, the Sith Lord Darth Vader will appear as a guest character in the PLAYSTATION3 system version of the title, and Jedi Master Yoda will be available for the Xbox 360. Delivering a robust offering of new gameplay modes and enhanced features, Soulcalibur IV will raise the bar of excellence for all next-generation fighting games. "It is quite rare that two publishers of this caliber are able to collaborate on this level to create a top notch entertainment experience for next-generation platforms." said Makoto Iwai, executive vice president and COO at NAMCO BANDAI Games America Inc. "In the entertainment industry, LucasArts possesses some of the most recognizable characters and franchises in the world. We're thrilled to integrate their historic characters into one of our most treasured brands"
"We're very excited to work with NAMCO BANDAI and be a part of their efforts to take Soulcalibur to the next level," said Kevin Kurtz, director of marketing at LucasArts. "Adding our iconic Star Wars characters to NAMCO BANDAI's great game franchise is a match made in heaven,and we think Darth Vader and Yoda will be formidable opponents in the game." Shown in true high-definition graphics, Soulcalibur IV offers an entirely new battle system that promises to revolutionize the fighting game genre. Featuring an expanded customization mode, Soulcalibur IV allows players to personalize a character to look and perform as they desire. Also, for the first time in the franchise, customized characters or original favorites can be taken online to challenge others for the top spot of this timeless series. Developed by Project Soul, the legendary team behind Soul Blade® and Soulcalibur® I-III, Soulcalibur IV is set to reinvent the brand and reintroduce the fighting genre to new and existing fans alike.